80stoons showcases the coolest cartoon shows on TV in the 1980s. On 80stoons you can find information about the creators of the shows, character information, episode list and guides, pictures, reviews, toys and merchandise information, voice cast, videos, music and much more. 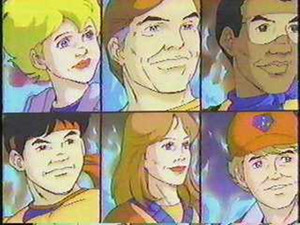 Relive the memories of awesome TV cartoon shows like the Transformers, Jayce and the Wheeled Warriors, Jem & the Holograms, He-man and the Masters of the Universe, Ducktales, Beverly Hills Teens, etc. Browse through the list of shows to find your favourite cartoon shows from the 80s. Read our blog with articles about anything having to do with cartoon shows from the 80s. (Dutch only) Ga naar dit coole boek over persoonlijke ontwikkeling: Is het al weekend?. Totally 80's collage by J. Scott Campbell. Originally appeared in Wizard Magazine #136 in 2002. 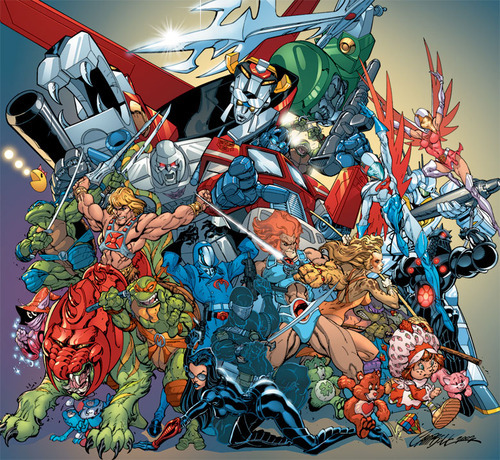 Pictured are: The Smurfs, He-man and the Masters of the Universe, Teenage Mutant Ninja Turtles, Ms Pacman, Transformers, Voltron, G Force, Thundercats, G.I. Joe, Care Bears, Strawberry Shortcake, Rubik's Cube and Robotech. Bionically upgraded family of superheroes the Bionic Six has been added!